Very recently, I received an email about a chef’s course event at The Butcher & Larder in Chicago’s Noble Square neighbourhood at 1427 W. Willow Street. The event was for Piggy Bank, which is a foundation that was created to gift heritage breed pigs to family farmers in exchange for business plans. Given the ongoing discussions about meats being tainted with growth products and unhealthy additives, support for farmers who want to provide healthier meat products was not a bad idea to support. 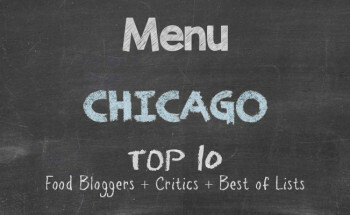 With a selection of five chefs from different restaurants in Chicago, we had a splendid sampling of dishes to entice the palate. The first course was prepared by Chef Sarah Rinkavage of Lula Cafe. 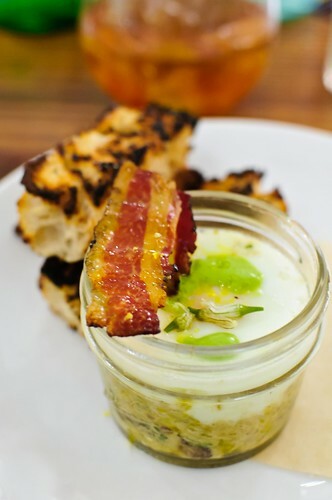 This came as a cup of coddled egg highlighted with morel, green garlic, and tessa and topped with a strip of bacon. Although one could scoop out the egg with a spoon, it was better to have use of the accompanying grilled toast as a utensil. A perfect pairing with the coddled egg was a 2013 Kettmeir Pinot Grigio from Alto Adige DOC Winery. The second course was prepared by Chef Andres Gietzen of Yusho at 2853 N. Kedzie Avenue. 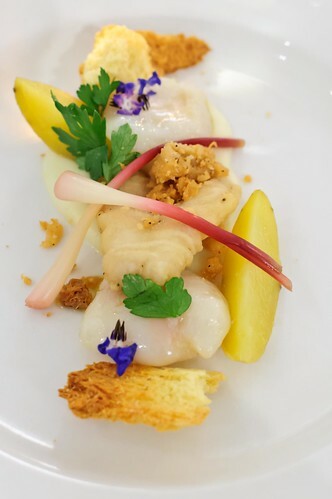 Given in name as a Tongue ‘n’ Cheek Brewis, this came as a dish of fried cod tongue, lard poached cod cheek, scrunchion, billy bread, and ramp. This was perhaps the most exotic of all of the dishes on the menu. Tender and with a hint of cod without a heavy taste of muddy cod, it was also still light enough to enjoy to completion and it also paired well with a 2013 Kettmeir Muller Thurgau from Alto Adige D. O. C. Winery. 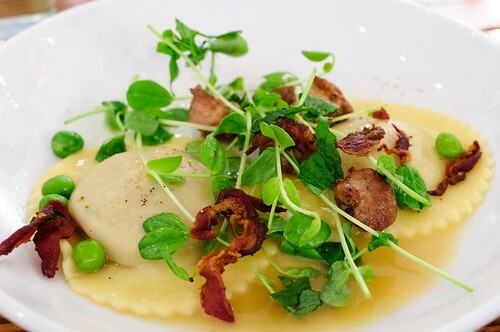 For the fourth course, Chef Christopher Thompson prepared a braised lamb ravioli with house-made ricotta, English peas, mint, lemon, sweetbreads, and belly. The lamb was extremely flavourful, but it had to be enjoyed without indulging any of the sweetbreads and belly simultaneously, lest the flavour of the lamb lose centre stage on the palate. The pairing for this rich dish was a 2010 Lamole di Lamole Gran Selezione Vigneto Campolungo from Chianti Classico DOCG Winery. This worked better with this dish than with fava beans — a nod to “Silence of the Lambs,” and rather fitting also given the filling in the ravioli. The fourth dish was courtesy Chef Andres Padilla of Topolobampo at 445 N. Clark Street. 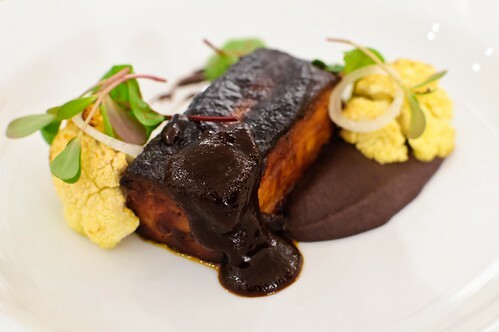 Following the pork theme, this was crispy seared, braised pork belly glazed in sweet and spicy salsa negra — think mole — over Oaxacan black beans with charred cauliflower and garnishes. The gotcha with this dish was the layer of fat atop the pork belly and covered under the tasty salsa negra. The wine that was paired with this dish was a 2011 Lamole di Lamole Chianti Classico Riserva from Chianti Classico DOCG. 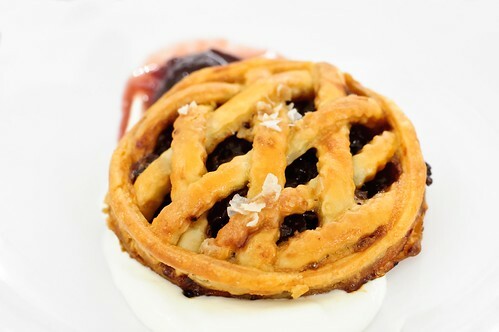 The finale was a Linzer torte with bacon jam, prepared by Chef Abra Berens of Stock Cafe. For all of the ends of bacon that had been saved from preparations of the courses, they were used for the filling. This was a savoury pie, not a sweet. And there were two strong flavour profiles on the tongue simultaneously, one influenced with sweetness and the other salty. Perhaps a cup of coffee would have cut down some of the bonanza on the palate. One participant in the evening’s event was a representative for Dry Sparkling. 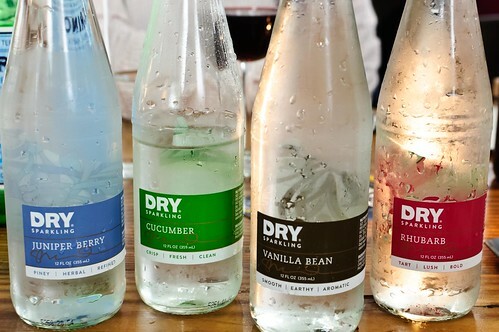 Refreshing and bursting with natural flavours, these were reminiscent of sparkling water with flavouring. However, the sparkling aspect of the beverages did not bite at the back of the jaw, which made them a lot more inviting than anticipated. The cucumber flavoured Dry Sparkling beverage is now my favourite and after hearing that they are available at Target and Whole Foods, I shall fill my refrigerator accordingly. The Butcher & Larder is a local grocery store that offers a lot of organic products, as well as fresh meat products. Being in the meat services makes it understandable that they’d engage involvement in the Piggy Bank, as mentioned earlier. One individual who sat next to me mentioned that they offer lunch, but I’m sure they excel in the products and services that make them a great grocer and butcher shop. Much success to them for their efforts in the clean eating initiative. Thanks. As I had mentioned in a reply on Facebook, the Nikon D90 with the 35mm f/1.8 prime lens was a tremendous help. It was my favorite lens before I upgraded to a full frame. Now, I use the 50mm f1.8 often.